Low-profile vehicles such as pony carts driven on public roadways create unique safety concerns for both those driving the vehicle as well as for passing motorists. Pony carts in Amish communities are often driven by younger children who may not have as much experience operating on roads as those driving larger buggies and wagons. A motorist could easily be traveling more than 10 times faster than the speed of a pony cart. The Holmes and Wayne counties Amish Safety committees contacted The Ohio State University's Agricultural Safety and Health program to discuss the need for enhanced lighting and marking on low-profile carts. After meeting with more than 85 community members, pony cart manufacturers and dealers, recommendations were developed for an improved lighting and marking practice for pony carts. A national standard issued through the American Society of Agricultural and Biological Engineers (ASABE) had already existed for larger buggies and wagons since 2001. This national practice was revised to include low-profile vehicles, specifically pony carts. The goal was to provide a standardized recommendation with the intent of enhancing the visibility of individuals who operate pony carts on public roads. The key components are described in this fact sheet and summarized in Table 1. Table 1. Low-Profile Vehicle (Pony Cart) Lighting and Marking. 1Animal-drawn vehicles with a lighting system should be equipped with a battery-operated or generator-powered system. Batteries may be typical storage, deep cycle or gel cell conforming to SAE J537. The SMV emblem (Fig. 1) is a unique marker identifying vehicles traveling slower than 25 mph. Studies show that two out of three highway crashes involving slow-moving vehicles are rear-end collisions. The majority of these rear-end collisions occur during daylight hours. During the day, the bright, nonreflective orange triangle of the SMV emblem gains the attention of approaching motorists from more than 1,000 feet away. This provides advance warning to motorists that are approaching a slower moving vehicle. At night, the reflective border of the SMV emblem glows brightly in the path of approaching headlights. A full-sized SMV emblem should be mounted on the rear center of the vehicle, with the triangle point facing upward, 2–4 feet above the surface of the road. Figure 1. Slow-Moving Vehicle (SMV) Emblem. The SMV emblem is documented as effective when it is visible, especially when vehicles are approaching on flat terrain and straight sections of roadway. 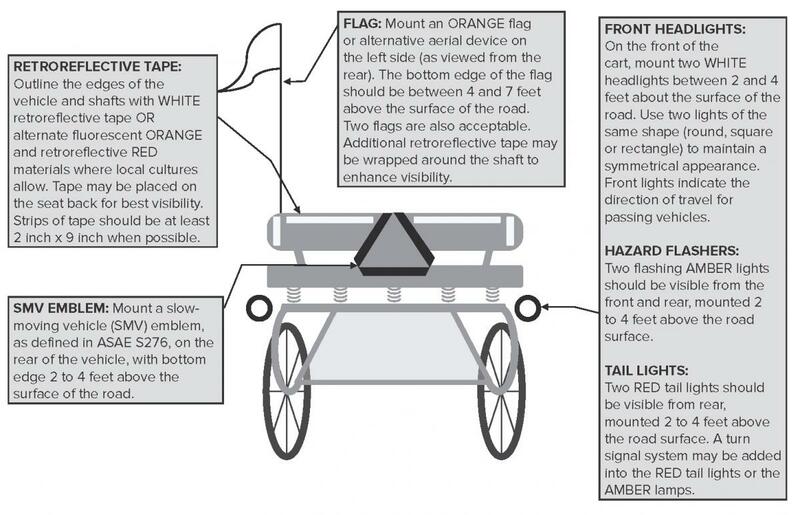 To provide greater visibility of low-profile vehicles on curves and over hilltops, an orange flag should be mounted on the left side of the cart. The approximate mounting height of the flag should be 4–7 feet above the surface of the road, and will depend on the terrain in that area. For example, carts driven in flat, open areas should mount a flag that is about 4 feet from surface of the ground to the bottom edge of the flag. If the cart is driven in a region with more hills, a flag that extends 6–7 feet above the road surface may be more effective. Community safety leaders have also suggested wrapping retroreflective tape around the shaft of the flag pole for added visibility. Orange flags will typically fade and should be replaced every year as needed. Weather and direct sunlight tend to cause more extensive fading over time. It is often difficult to tell how faded a flag is until holding a new flag next to the old one. Community leaders are working with product engineers to develop a medium-cost alternative to the orange flag that will not fade as easily over time. Mounting reflective tape to a low-profile vehicle can be more difficult than fastening to a larger vehicle such as a buggy, but is just as important. Current retroreflective tape is effective in daylight and at night. A study conducted by the National Highway Traffic Safety Administration (www-nrd.nhtsa.dot.gov/Pubs/809222.pdf) found that use of retroreflective tape reduced the number of side and rear impacts into heavy semi trailers by 29 percent. This group also estimated that the use of reflective tape could reduce the number of collisions by 7,800 per year. Knowledge about how tape can be used to increase the visibility of semi trailers can be applied to pony carts. The rear-facing edges of the pony cart should be outlined with retroreflective tape to get the attention of passing motorists. In addition, yellow retroreflective tape should be placed along the vehicle tongue or shaft, visible on the outside of the animal. Most pony carts and other low-profile vehicles are driven in the summer and are primarily operated during the daylight. Animal-drawn vehicles can be equipped with a battery-operated lighting system. Adding lights such as amber hazard flashers, small headlights and red taillights will provide the best option for maximum visibility during all conditions. This recommended practice establishes a unique identification system for slow-moving, animal-drawn vehicles on public roadways. It is intended that this identification system be used to complement existing laws, rules and regulations in individual states, provinces and municipalities. It is recognized that this recommended practice can raise cultural or religious issues and is not intended to devalue or replace those values. It is intended to provide options to those who would like to add or enhance lighting and marking of their animal-powered vehicles in the form of a voluntary consensus standard. ANSI/ASAE, EP576. 2 October 2012, Lighting and Marking of Animal-Drawn Equipment, ASAE Standards, American Society of Agricultural Engineers (ASAE), St. Joseph, MI 49085. National Highway Traffic Safety Administration (NHTSA), The Effectiveness of Retroreflectie Tape on Heavy Trailers, NHTSA Technical Report, National Highway Traffic Safety Administration, Springfield, VA 22161. For additional information, visit agsafety.osu.edu or request a listing of the available fact sheets from your local OSU Extension office. Reviewed by Ann Christy, PhD, Department of Food, Agricultural and Biological Engineering, The Ohio State University, and Kay Moyer, Lancaster County Extension, Penn State University.